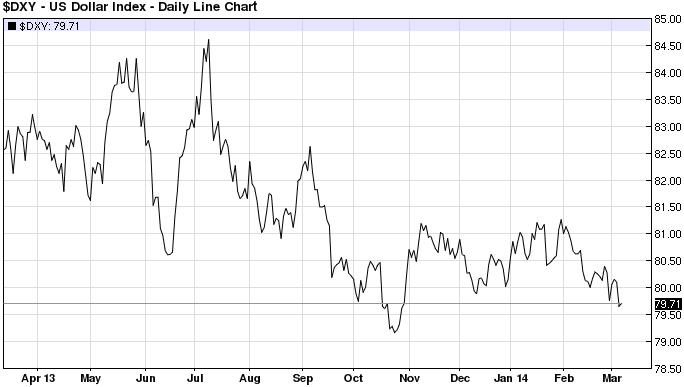 The US dollar has been surprisingly weak recently. In fact we are at the lows not seen since just after the US government shutdown when treasury default jitters (see post) sent investors fleeing. Why is the dollar so weak? Reasons include some economic improvements in the Eurozone and the ECB's persistent hawkish stance. That's been driving up the euro. 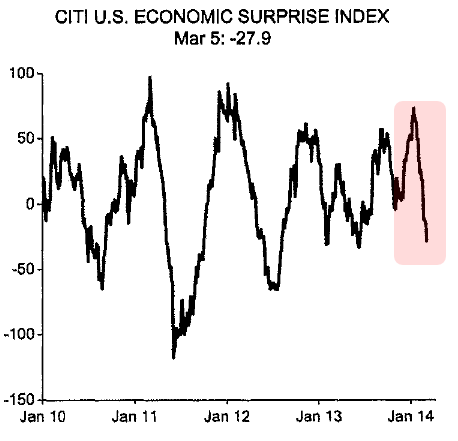 But the main reason has been the barrage of soft economic data out of the US in the past couple of months. However, as discussed earlier (see post), the soft economic patch in the US could be transient. We saw a sign of that in the latest US employment report (see story), which is the justification the Fed needs to continue reducing securities purchases. As the weather across the US improves, economic activity should pick up (some leading indicators already support this thesis) and longer term rates are likely to move higher. And with that we should see the dollar strengthen.